We start 2016 as we started 2015 – with big challenges for the health system and uncertainty as to how governments will meet them. The health care headaches in 2016 are, in fact, the same ones we faced a decade ago, albeit different in severity and symptoms. They include population growth, ageing and the rise of chronic disease; inequality in access to care and health outcomes; technological change (the good, the bad and the expensive) and the seemingly inexorable rise in health costs. Circling for landing are three major reviews on private health insurance, primary care, and low-value care. Their recommendations, and the government’s response to them, are very much up in the air. Adding to the uncertainty is the broader review of federalism and its consequences for public hospital funding, along with speculation around the 2016 federal election date and what each party’s Santa sack of election promises might contain. 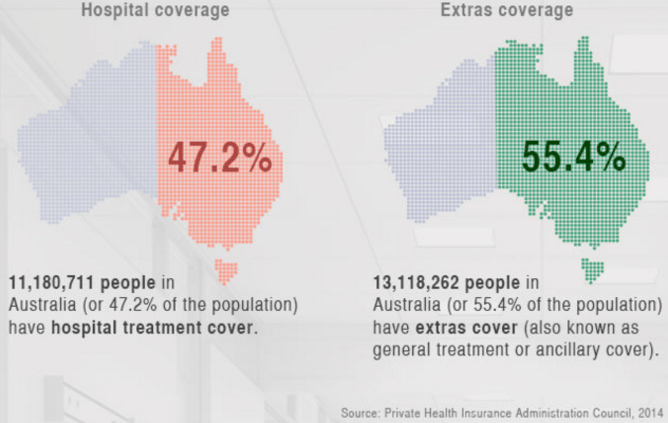 The number of people with private health insurance continues to creep up but the market is not in good shape. The rebate is one of the fastest growing areas of government health expenditure and complaints about the product abound. High levels of coverage are being achieved throughcarrots (the rebate) and sticks (penalties for the uninsured) rather than genuine consumer appeal. One solution being floated is for the whole subsidy framework to be thrown out. Instead of subsidising private insurers, which pay private hospitals, the government could subsidise private hospitals directly. Government advisers are impressed by the efficiency gains that activity-based funding (paying hospitals per procedure rather than a lump sum) brought to public hospitals and believe similar improvement can be brought to the private sector. The mechanism to achieve this could be a Hospital Benefits Schedule which, like the Medicare Benefits Schedule, would prescribe a schedule fee for private hospital care, based on existing Commonwealth payments for public hospital services under activity-based funding. The same schedule may later be used for public hospitals, replacing grants to the states. However, it will only be politically palatable if it is cost neutral for consumers or comes with reduced private health insurance sticks. The devil is in the detail of a new policy such as this. Will payment be to the hospital or surgeon? Will it cover the surgeon’s fee, as in public hospitals? Will it cover diagnostics? Without this information it is impossible to forecast the impact of the shift. This will be a challenging year for public hospitals. Major reductions in Commonwealth funding for hospital admissions – which continue to grow – will kick in from 2017, and states are likely to start the belt-tightening early. The cuts far exceed the productivity gains that can be made, so a reduction in services is certainly possible. Efficiency may be improved somewhat by the ongoing expansion of activity-based funding to mental health and “sub-acute” care such as rehabilitation and palliative care. The possible changes to private health insurance and a Hospital Benefits Schedule may be one way to put money from the federal government back into the system, but there is no sign that Treasurer Scott Morrison is keen to loosen the purse strings. Hospitals will also be under pressure to lift quality. Hospitals face increasingly stringent “quality standards” with tougher monitoring covering a broader scope of issues, including access and timeliness. Meanwhile, the increasing array of publicly available data is putting variation in hospital performance under the spotlight more and more, with commensurate calls for greater accountability. Two independent reviews of Medicare are expected to land sometime in 2016. The first examines primary care. It could address any number of challenges, including chronic disease management, “six-minute medicine”, co-payments, frozen rebates, and the growing corporatisation of general practice. Management of chronic diseases such as diabetes, heart disease and cancer poses the main challenge. The rise of chronic disease is imposing big costs on a system that wasn’t designed to provide the complex, continuous and coordinated care now needed. The government will have to consider far-reaching reform with only limited and equivocal evidence to draw on. Options on the table include a shift in the balance of payments to practices, with less emphasis on payment for attendances (fee-for-service) and more emphasis on payment for care over the episode of illness or year (capitation payments). There may be other changes in payment structures. The government’s long-standing desire to reduce perceived incentives for six-minute medicine may see a minimum consultation time imposed on the standard (level B) fee. If sense prevails we won’t see a resurrection of the GP co-payment policy zombie. We should, however, see an end to the freeze on medical rebates; the only question being when and with what trade-offs. A further issue to be addressed is the shift toward practices owned by corporate chains that profit from referrals to and provision of diagnostic services, such as blood tests and X-rays. The implications of changed ownership structures for practice are not at the forefront of practice payment redesign but should be. The second review looks at quality and cost-effectiveness of items on the Medicare schedule. The review got off to a rocky start with wild claims about 30% waste in the system, and release of its first list of items targeted for delisting in the sleepy period between Christmas and New Year. The work on modernising the schedule will come to fruition in 2016. There will be individual and group losers in this process who undoubtedly will scream loudly with varying levels of effectiveness. It isn’t yet clear whether Health Minister Sussan Ley’s appetite for reviews portends massive reform to the sector, or simply a politically judicious preference for treading water in a portfolio still reeling from tumultuous management by her predecessor. However, the auguries are good for the former. The scene for change has been set, at least with the medical profession. Respectable leaders are engaged and leading some of the review processes. Hopefully this will be the year the health system rises to meet the big challenges of 21st-century health care. Stephen Duckett, Director, Health Program, Grattan Institute. This article first appeared in The Conversation on February 1, 2016. This entry was posted in Economy, Health, Politics and tagged health reform, Medicare, private health insurance, Stephen Duckett. Bookmark the permalink.